Happy New Year! I’ve started mine by tidying up my many desktops: my physical desk, my laptop’s desktop, and SharePad. I did so much experimenting with SharePad in 2017, I’ve overwhelmed the lists of settings. Settings are how we make SharePad our own. They are where we save list and chart configurations we use repeatedly, so we don’t have to keep recreating them. They’re one of the ways we gain an edge, because no two investors’ settings will be the same. They’re worth a bit of attention. You can apply settings to the blue list view, which tabulates the data, and the green price and financial charting views, which chart it. 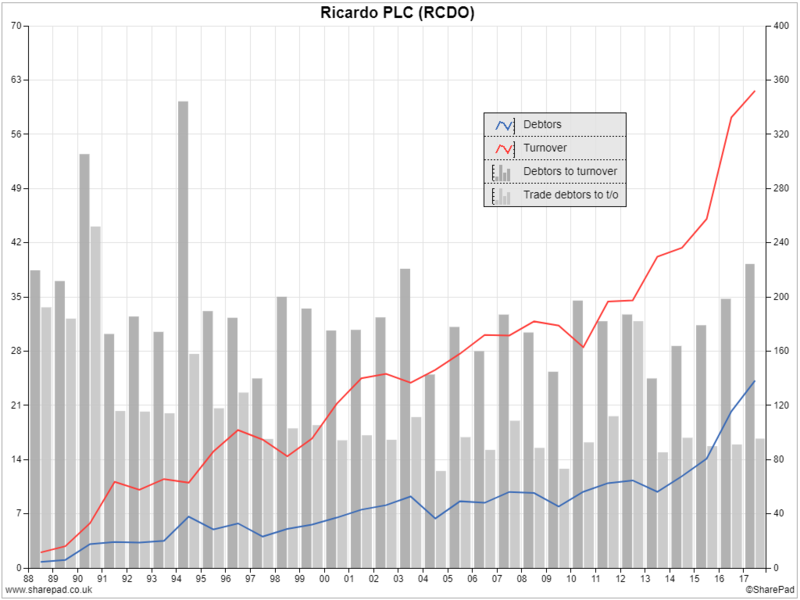 I use SharePad’s default price charts, but my tables and financial charts badly needed attention. To declutter my settings, I deleted all abandoned experiments and renamed the survivors so they meant more to me. Still nestling in the settings were SharePad’s defaults. Although I don’t use them, I might one day, so instead of deleting them and regretting it later, I prefixed all my own settings with a hyphen, which floats them to the top of the list. I’m going to share three of those hyphenated settings with you today, because they’ve helped me think more clearly about three highly successful companies. James Halstead: Growth or income? Zooming right back to the last millennium you can see a bit of vinyl flooring manufacturer James Halstead’s incredible dividend record. The company says it’s raised the dividend for over forty years. The orange bars show the dividend paid out per share. Halstead’s profit growth represented by the green bars (Earnings Per Share), also looks pretty impressive. 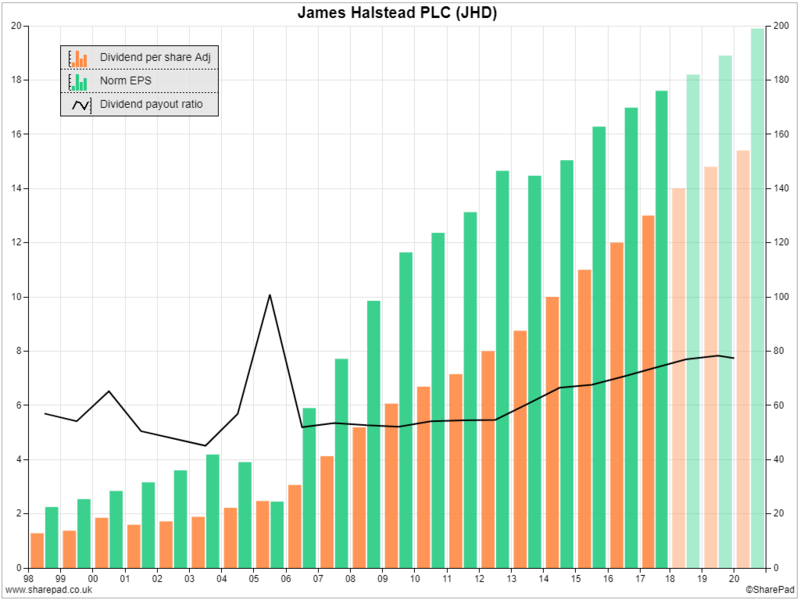 The black line is the dividend payout ratio, the percentage of profit used to pay the dividend (calculated by dividing EPS by DPS). The final six bars, for 2018 to 2020, are forecasts provided by analysts and judiciously, because they are only forecasts, SharePad has faded them. Look carefully and you’ll notice the dividend has been growing faster than profit, which is why the payout ratio has increased, from just over 50% a decade ago to 74% in the most recent financial year. It is forecast to rise to almost 80% (you can see the figures in the Ratios section of the Financials tab in SharePad). Since 2010, dividend per share has increased at a compound annual growth rate of 8.6% compared to 4.5% for profit. You may not, though, have spotted that the rate of growth of both profit and dividend is slowing. The increase in the dividend is fairly constant in absolute terms, but as the dividend grows the increase is less as a proportion of the previous year’s (larger) dividend. 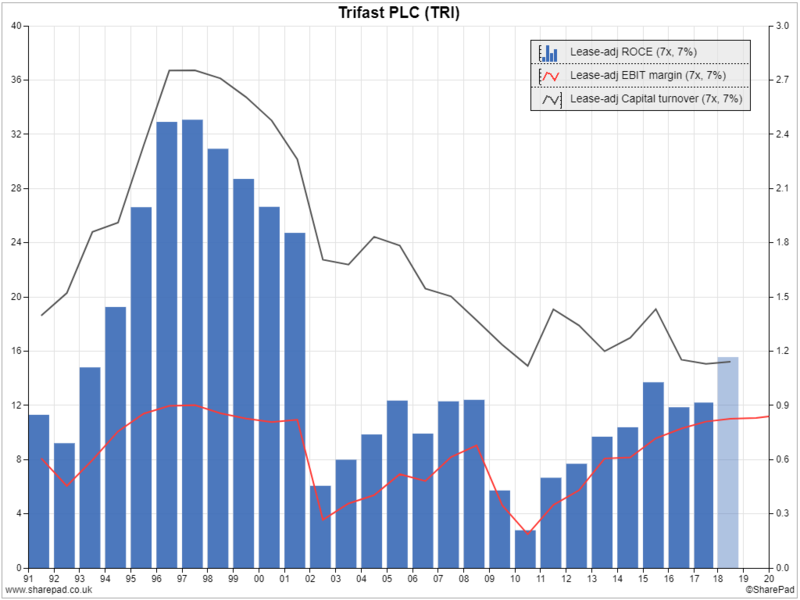 Whenever you see a straight line on a chart with an arithmetical scale like SharePad’s, the rate of change is slowing. A company shouldn’t be able to pay out more than 100% of profit as a dividend for any length of time, so unless Halstead can increase profit growth faster, dividend growth will have to slow even more than the rate at which it is slowing now. Ricardo: Should it be so trusting? Ricardo is an engineering and environmental consultancy. It sells expertise and engines and it does it pretty successfully. The red line in my chart is turnover (revenue), and it’s going from bottom left to top right so all is good, except… The blue line is debtors, which in Ricardo’s case is a significant component of revenue. It has also risen sharply. Companies routinely recognise revenue before they actually receive the cash, usually when they invoice a customer, in which case the money owed is known as trade debtors. Companies working on contracts, as Ricardo does, sometimes recognise revenue before the work has even been invoiced, this money is accounted for as other debtors. The blue line on the chart is total debtors. There is nothing underhand about this; it’s the way accounting works to match costs to revenues. But debtors represent revenue that has not yet been collected, so there’s a risk, however small, that it won’t be. Investors get nervous when debtors is high relative to revenue, or if it increases rapidly, because the company may have to write off a portion of the money owed, reducing the amount of revenue and profit the company earned retrospectively, and undermining our own reckoning of the company’s growth, profitability and value. You would expect debtors to rise in proportion with revenue, the more customers are spending the more they will owe, but over the last few years growth in debtors at Ricardo has been higher. The dark grey bars show debtors was nearly 40% of revenue in 2017, up from 25% or so a few years earlier. Rewind back to 1988 and we can see Ricardo has lived with high levels of debtors before (and prospered). Often rising debtors is just a matter of timing. Ricardo was very busy towards the end of its financial year in 2017 and its customers owed it a lot of money at the year end. Results in 2018 should show a decline in debtors, because the money has been received. But Ricardo also says it’s earning proportionally more revenue from the Middle East and China, where payment terms are longer, and that makes me think shareholders should probably keep a watchful eye on debtors. Trifast: Will history repeat itself? If Trifast’s Return on Capital Employed charted over the last quarter century looks like a roller-coaster to you, then you are not alone. The chart shows that sometimes Trifast has earned extraordinary returns, most of the time it makes good returns and in a few years, the early nineties, 2002 and 2003, and 2009 to 2012, returns have been sub-par. Trifast’s performance is cyclical, which is hardly surprising when you consider what it does. It manufactures and distributes fasteners, also known as nuts, bolts, screws, and rivets. Its products hold together cars, washing machines and electronics. The company’s extraordinary profitability in the late nineties is easy to explain, it was almost entirely focused on electronics during the technology boom of that time. It also lost its way during the financial crisis when demand for fasteners slumped. It would be wrong to think that fasteners are a commodity, though. Just like every component, performance is critical. A failed fastener could hold up a production line or render a product defective. A lot has changed at Trifast too. The company has diversified and acquired famous brands like Pozidriv. Even so, the power of the chart is such that, while I’m prepared to believe Trifast’s results may be less wild in future, I can’t believe it’s immune to the cycle. If you need any help setting up these financial charts in SharePad, call the support team on 020 7749 8555.